This tutorial is for merchants with a Shopify online store. If you want to install a referral program on your Shopify, please continue reading. Otherwise, go to our integration section and find the guide that best fits your needs. 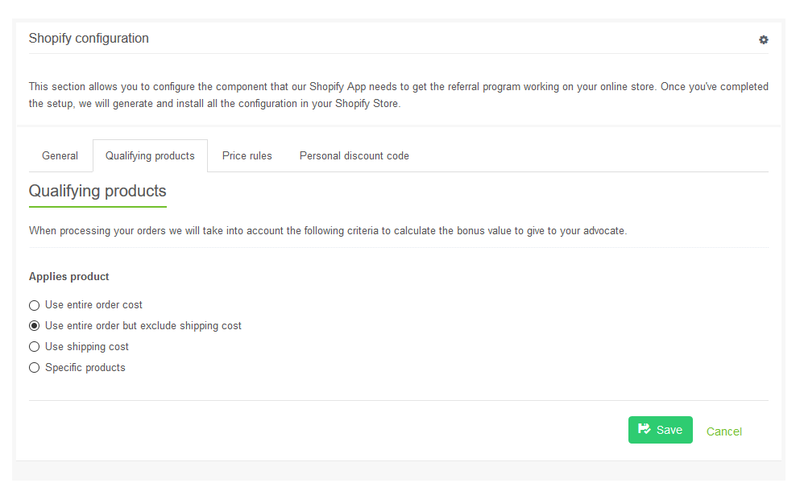 On Shopify's apps store you can find the app 360 ° Referral program Suite. 1. When selecting the "Add app " option. An interface will be shown so you can insert the URL of your store and access it to continue with the installation progress. 2. When you access your store you will be shown the installation option. 3. By clicking on the "Install app" option, a form will be displayed to create your genius referrals account. 3.1 Insert your email and password to access your new referral program. If you already have an account in Genius Referrals when you insert the email it will be identified and you can specify if you want to continue with that account or insert a new one. 4. Select the option "Ok let´s move on!”, then select the payout method and specify how much you want your advocates to get per referral. 5. We continue with the selection of the referral program template. 6. The next step is the construction of the profile, program, and integration this process takes a few seconds. 7. Once the process is completed, a new interface will appear that will serve as a guide to review your referral program, the integration, and all the necessary content to make your program works as expected. Take a moment to review your incentive model, the look and feel of your template and integration option which will give you full control over your new referral program. To see the integration's options you can access the Integrations section in the main menu. Clicking on the Shopify integration will show the details of the integration. You can edit all available options and disconnect the integration if you wish. 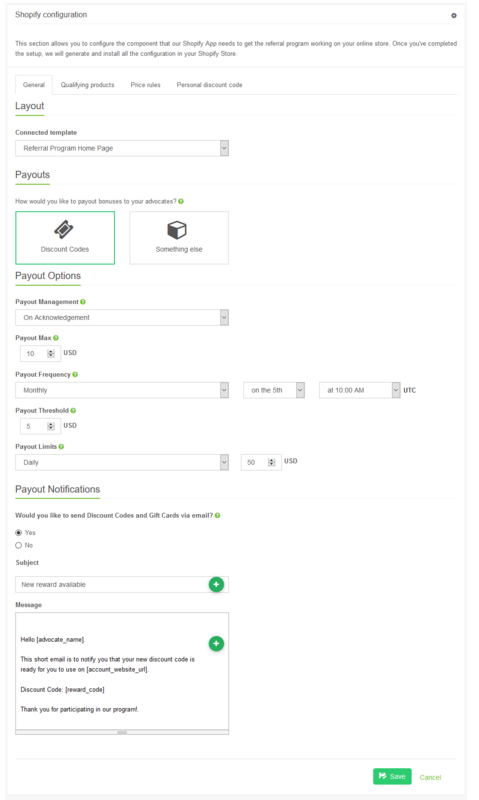 On this section, you can select the referral program template, the payout method, the payout options where you can set the limits and the frequency of how you want payouts to your advocates to be processed. You also have the option to modify the message that advocates receive when they receive a discount code. From this section, you can specify the criteria to be taken into account when processing orders to calculate the value of the bonus that will be granted to your advocates. Here you can specify the rules that will be taken into account when generating discount codes to payout your advocates. This section works in a similar way to the rules that you can specify in Shopify when creating a new discount code. On this section, you can set up the discount code rules that we will use to generate your advocate's personal discount codes. Each of your advocates will have its personal discount code that he can share with his friends and family members. Friends and family members can then apply the discount code on the checkout page. 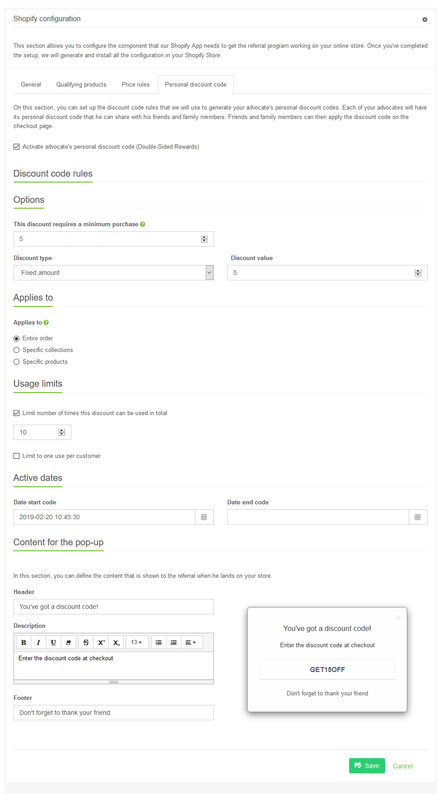 If you activate the advocate's personal discount code, the necessary configuration options are displayed so that they can be used. 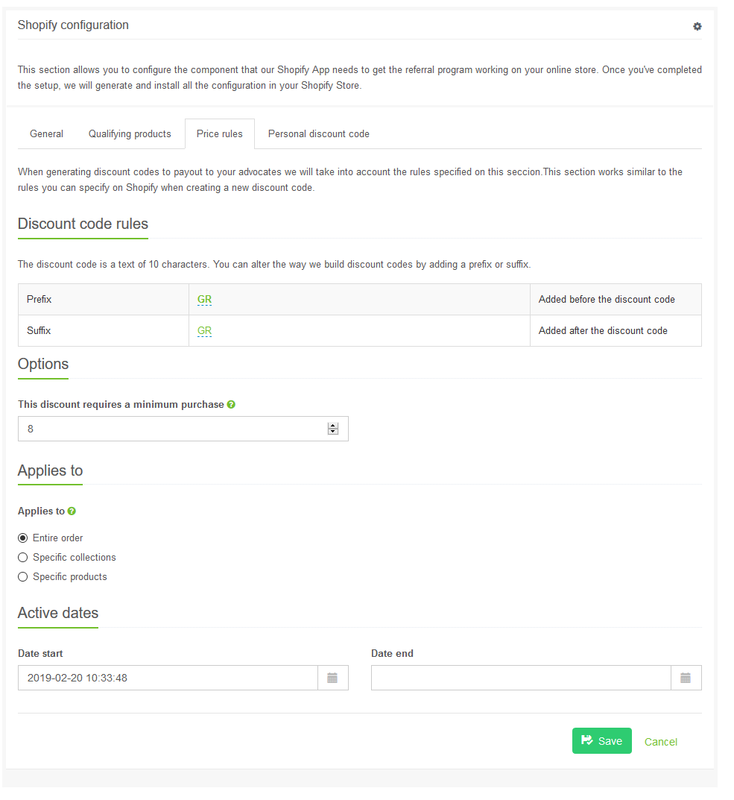 You can define what is the minimum purchase required to apply the discount code. The discount type that can be fixed or percentage, in addition to establishing the value of the discount. Also, you have the option to specify to whom the code applies, the usage limits and the time during which it will be available. Finally, you can configure the content that is displayed in the message that appears in the store with the personal discount code of its promoters to be shared with their references. The next step is to add the navigation link to your main menu or footer to link to the referral program page. Follow the instructions on this page. If everything goes well, you should be able to load the referral program on this new page. Congratulations! You've completed the first part of this tutorial. You have a Shopify store that sells t-shirts online. For John to be able to refer products he needs to access the referral program page and use the referrals tools to share the services. John will be able to use all the tools on the 'Referral tools' tab. In this scenario, John sends to Matt his personal URL (referral tool 2) so that Matt can check out the services and become a customer. Now we need to check if the advocate (John) receives a bonus once the referral (Matt) completes his purchase. To test this, Matt has to complete a purchase, once a purchase is completed John should receive a $10 bonus on Genius Referrals. Check the images below. On this scenario, every time a referral (Matt) completes a purchase on your store, the advocate (John) will receive a new bonus. Testing that bonuses are redeemed as Discount Codes. 1. Log in the Referral Program. 2. Go to the Redemptions section, where the bonuses that you have available is shown, the option to send new redemption requests and at the end the redemption history. 3. Since John has $10.00 bonuses available, he will create a redemption request to obtain a $10.00 discount code. In the end, when the redemption request is completed, the advocate (John) receives a message via email with the $10.00 discount code that can be used on your store. That's all. If everything here has gone well, your referral program works correctly.